Wednesday, October 31 - 7 P.M.
"In order to go undetected by the police, three sisters on the run from a ghost town called BODIE give strictly underground concerts. Their names: Blanche, Andrée and Imogène. If you spot them, please alert the authorities... or not!" More than just a concert, BODIE gives a real show, staged by Arnaud Joyet and Oldelaf. 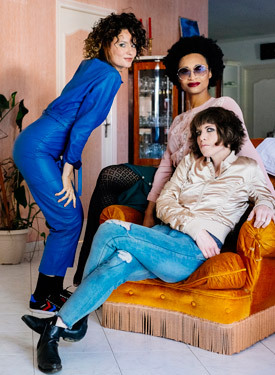 Emilie Marsh (Imogène), Joko (Blanche) and Cécile Hercule (Andrée) guide us through their peregrinations with catchy pop tunes and hard-hitting lyrics!